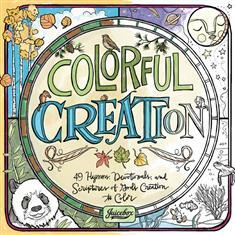 This adult coloring book reflects the beauty of God's creation, visually portraying the handiwork of those seven days with scripture passages, hymns, and devotions. Beautifully lettered and illustrated in seven different sections, this coloring book gives you the opportunity to contemplate God's creativity along with your own. Grab your markers and pencils as you embark on a colorful journey through all that God has made!